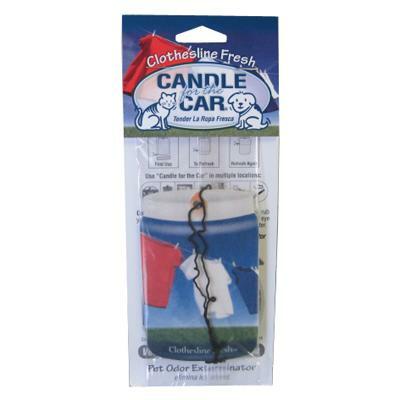 Candle for the Car provides the same great air freshening power that Pet Odor Eliminator Enzymatic Candles do, but in a convenient, compact, and hangable form. High quality and detailed, this air freshener is perfect for your car, truck, boat, or RV. It also works well in areas that can always use a little freshening up, such as gym bags and lockers, closets and hampers, and rest rooms. You've got to smell to believe! Clothesline Fresh scent. Single air freshener with string hanger.